Color by Number Coloring Pages for adults and kids. Download Now! Love Pixel - Color by number, numbers coloring, a brand new colouring book for adults and kids! 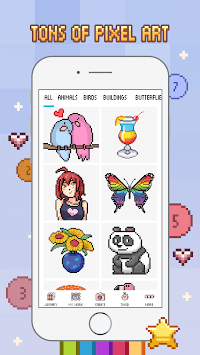 Spend endless of hours to colour more than 20+ popular categories, 1000+ beautiful pixel art images provided to you by Love Pixel: Color by Number. Love Pixel - Color by number, your free coloring app, is one of the best pixel art game designed to be played by the whole family, all ages! 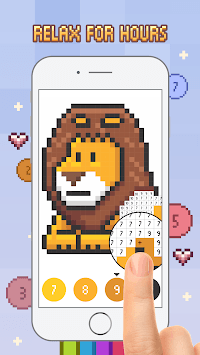 If you are feeling a bit stress lately, playing Love Pixel: Color by number will help you to calm down and relax for few hours. For children at home, it’s one of the best way to help your kids to develop their concentration and recognition of colours and numbers! - Great variety of colouring pages for any taste: Mandalas, Patterns, Animals, Birds, Flowers, Places, Food and many others. More than 20+ categories ! - More than 1000+ pixel artworks to choose from. New coloring images added weekly! Easy colouring: Long press feature to color continuously which makes coloring and drawing more easily and fun! Create your own artwork: Take pictures with your phone or upload them to create your own pixel images. Quick sharing: Opportunity to save your artwork and share it with your friends! Time to relax and enjoy your new pixel coloring app!